I thought that I would do something creative for my son’s birthday present this year. 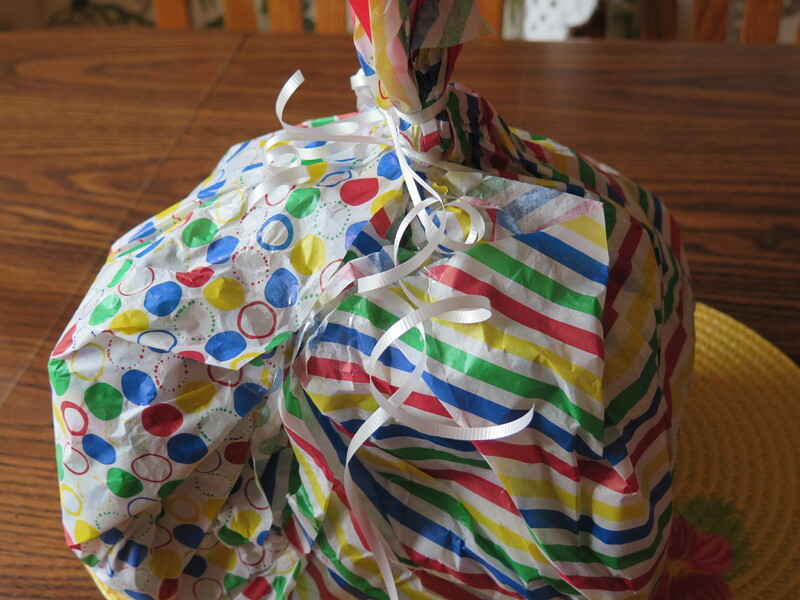 I had envisioned several complimentary tissue papers wrapping the gift and enough extra to tie into a puffy top. It started out as a good idea, it might well have lived up to my vision for it, if there had only been less box and more paper. At those moments when we are beating ourselves up, when our self-talk is negative, we see only our flaws and are unable to see any good we’ve done . . . The scripture reminds us that we are a work in progress. We are people on the way, not the way. There is one Christ and we are not the one. We may fail wretchedly in life, but God continues to build us up. It is God’s joy to fulfill the good work started in us. God is not out to knock people down or to condemn, but to complete the work started already. God is in the building up business when we fail or fall short, when we despair over ourselves . . . when we blunder mightily or feel defeated in life. We are unfinished people. God loves us in our fragility, woundedness, in the midst of our dysfunctional behavior our vulnerabilities and everything else. God loves us when we are at our worst and at our very best. Because, God’s love is never ending.